A Hamilton County business is looking for ways to support its employees and encourage professional growth. NOBLESVILLE — A Hamilton County business is looking for ways to support its employees and encourage professional growth. The focus on employee growth at Helmer Scientific is paying off for Chuck Phelps. Phelps expects to finish his engineering degree within the next 18 months. "I’m doing about two classes this semester," Phelps, a refrigerator technician, said of his supervisors at the healthcare manufacturing firm. "I’m working a bunch of hours here but they’re really supportive." The company produces temperature-controlled storage equipment for labs, pharmacies, blood banks and other facilities. "We make incredible products here that impact people‘s lives," Phelps said. During a copper brazing demonstration at Helmer’s facility in Noblesville, Phelps told RTV6 about the path that led him there in 2014. "I was looking for a place that had consistent, safe work," he said. "It’s nice being in a climate-controlled area after being out doing construction in the weather." Before joining Helmer, he often spent two hours driving one way to work on construction sites in South Bend and Fort Wayne. "It’s a strain," Phelps said. "You try to make it back in time to pick up your kids and stuff like that." Phelps was looking for a change, as well as assistance with earning a degree. "They’re paying for everything,” he said. Angela Acrey, Helmer Scientific’s vice president of human resources, said the company’s education assistance program is not based on reimbursement. "We pay right up front for coursework and classes,” she said. When Phelps started, he saw himself eventually transitioning into a business administration role, but quickly discovered that engineering was his calling. "A couple of the engineers took me to the side and said, 'You need to go to school for engineering. You’re doing an engineering job and it’s something you’d be great at,'" Phelps said. Phelps said he learned multiple skilled trades on the job and was eventually promoted to master assembler. "He came in, he started to learn in one area, and continued to advance and grow and develop," Acrey said. "He took a gig opportunity and eventually moved into that department on a regular basis." The company said it saw 19 percent growth between 2017 and 2018, and is looking to hire nearly 30 full-time positions in Noblesville. The positions range from assemblers and fabricators to technical service support coordinators. The company also has several professional positions available, including a newly created director of quality role. Nearly all of the jobs require at least a high school diploma but have varying qualifications specific to each position. Helmer is seeking workers with an aptitude for technology. "We’re looking for people who can come in and do advanced manufacturing kind of work," Acrey said. 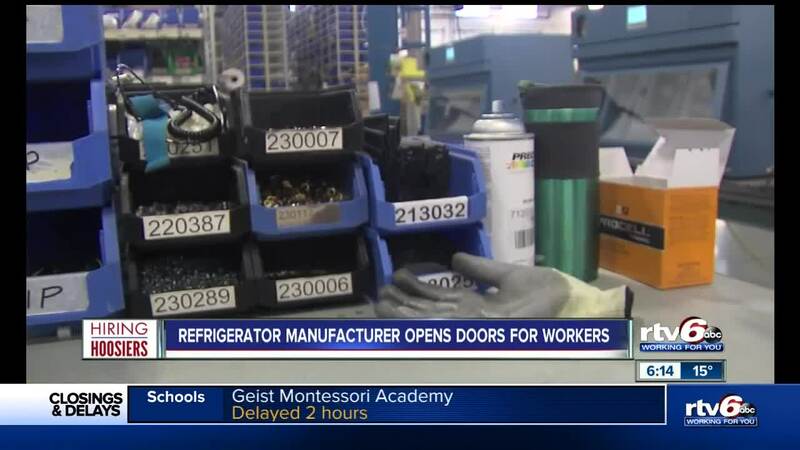 The company recently launched a new manufacturing trainee program that accepts workers with backgrounds in industries outside manufacturing. With plans to continue advancing within the company, Phelps said he’s grateful for the opportunities he’s earned at Helmer and for the quality of life he enjoys now that he’s spending more time with the ones he loves most. “It makes it where my family life is a lot less hectic and I’m not driving two hours one way to go to work, but also it’s great that everybody here really helps boost each other up," he said.